The UK Space Agency is on a mission to engage visitors to Dundee Science Centre in the fascinating world of space. As part of a £1.5M investment by the UK Space Agency in education and outreach projects, ‘Destination Space’ revolves around the European Space Agency’s first British astronaut Tim Peake. The new projects were announced 2015 today (Tuesday 14 July) at the UK Space Conference 2015, with Dundee Science Centre selected as one of 20 venues in the UK to host the celebratory events, to inspire young minds with the wonder of space flight. The initiative will also provide visitors with a unique opportunity to follow life on the International Space Station. With over 20 million visitors to UK science centres every year, Destination Space will give children across the nation the chance to learn about Tim Peake’s six-month expedition, a huge moment in British history, through hands-on experiments, rocket demonstrations, space equipment and live video from the International Space Station. 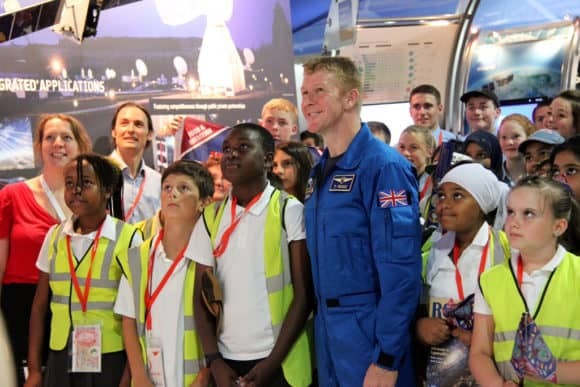 As well as learning about Tim Peake’s work on the International Space Station, the programme, which is led by The UK Association for Science and Discovery Centres, will celebrate the team behind Tim, highlighting great opportunities for young people across the science and space sector. At Dundee Science Centre, families and schools will be invited to join Destination Space through a calendar of events including the ‘Astronaut’ show, kicking off at the start of World Space Week in early October 2015. The show will also go on tour throughout Dundee and Fife community centres. Dedicating the Autumn season to the theme of space, there will also be a host of other special events, with the chance to watch Tim Peake’s launch live and meet real-life space experts through ‘meet the expert’ events. The Science Centre will also host a special event when Tim returns and, in January 2016, kick-start a schools programme dedicated to the mission, including themed schools workshops.